We welcome a conversation with all interested participants before commencing the program. Where is the venue for the MBSR (Stress Reduction) program? We run programs through the premises of the Melbourne Centre for Mindfulness. 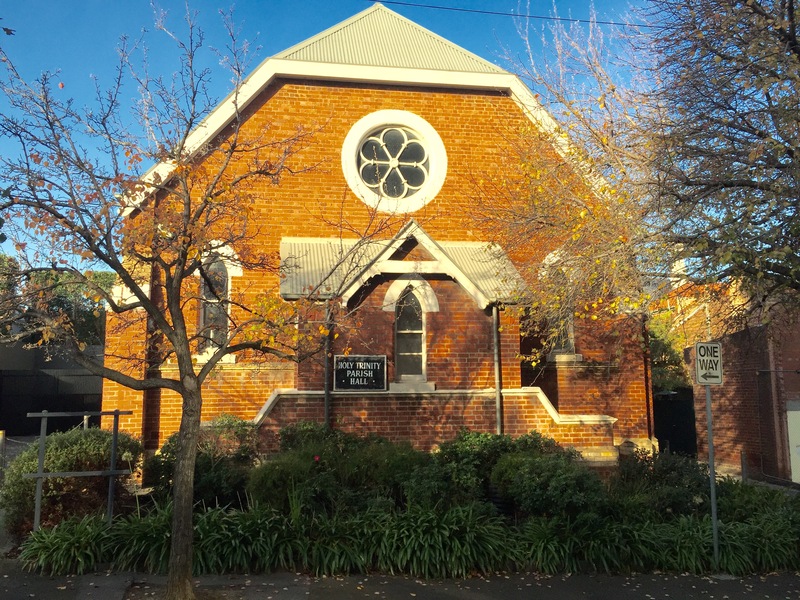 The Centre is housed in a beautiful former parish hall, at 16 Trinity Place, East Melbourne. It’s just near the Fitzroy Gardens. The Melbourne Centre for Mindfulness is conveniently located a short tram or train ride out from Melbourne’s CBD, and it’s an easy walk across the gardens from the CBD and surrounding inner city suburbs as well. Trinity Place is a cobblestone laneway running parallel to Clarendon Street between Hotham and George Streets. It’s very near the Pullman (formerly the Hilton) Hotel. Public transport, cycle or walk? Do consider making use of the abundant public transport options. Also, bikes can locked up outside the centre. Tram 75 from the Flinders St, or Tram 48 from Southern Cross Station via Collins St. both run along nearby Wellington Parade, stopping at Jolimont (Stop 11). Jolimont Train Station is only 400m away. The hall has disabled access from the front entrance, and several disabled car parking spots are located in Hotham St at the top of the laneway. There’s a 15 minute drop off/pick up point out the front in Trinity Place. For evening groups there is 2 hour meter parking on the Fitzroy Gardens side of Clarendon St. (restrictions end at 6.30pm). Usually there are no parking restrictions around the gardens on Sundays. On other days there is limited all-day street parking on Wellington Parade South, on the city end of Brunton Avenue. Download the Paystay app or call 1300 322 111 to pay by card. Fees in this area are 80 cents p/hr. Numerous commercial car parks operate in the area as well. Parking in the local area can be very scarce when football games or cricket matches are played at the MCG, or other community events are held in the area, so please check what’s on before planning your visit.